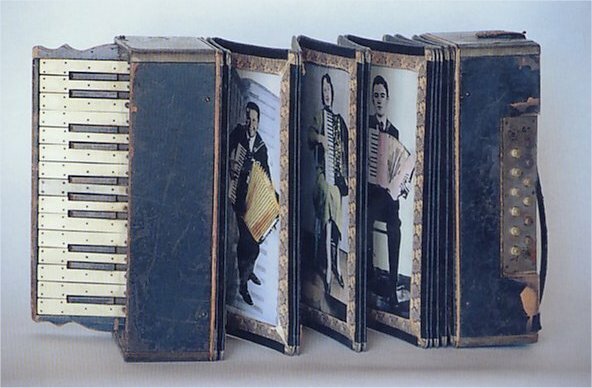 All of the books on this site were hand bound by Peter and Donna Thomas. Editoned books were letterpress printed by Peter on Peter's hand made paper. One-of-a-kind books were hand lettered, painted and embellished by Donna using Peter's handmade paper. Read the blog we keep about our travels to visit libraries and book arts centers around the USA. Click here. To see pictures of our tiny home artists' book-mobile, fashioned after a nineteenth century English "Redding" gypsy wagon. Click here. Read an article about our work -The DaVinci Creed - in the January 2009 issue of FBM. Click here. Watch us on Park City TV in Ori Hoffer's 5 minute interview on YouTube. Click here. A short video made when we were visiting RIT. Click here. Watch a 47 minute video of a talk we gave at the University of Colorado in 2011. Click here. Read an article about our work in the March 2009 issue of Fine Books Magazine. Click here. For a link to our book, "More Making Books by Hand" click here. To see my ukulele class and book arts folk song music page. Click here. 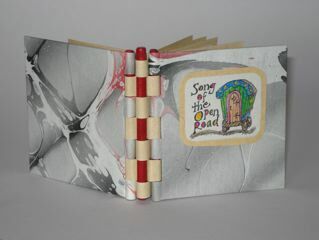 Listen to Peter play the book arts folk song titled "What's a Book?" on a ukulele book. Click here. Watch a 3 minute interview by Jim D'ville about our instrument books. Click here. Watch a different 3 minute interview showing a collection of 5 different instrument books. Click here. Read about our walk from San Francisco to Yosemite following the route John Muir used in 1868. Click here to read about the trip. Buy our guide book for walking to Yosemite following Muir's route. Click here for info. Read Muir's account of his 1868 trip published by the Yosemite Conservancy. Click here for info. Being a book artist is more than just making books; its living and breathing them. Its about becoming so involved with the subject matter that the physical attributes of the book reveal themselves. Its about listening to the materials invoke the proper text. Its about loving those materials and knowing them so well that we feel their desire to be used in the book we are making. We didnt begin our artistic careers planning to be artists of the book. It was more a case of being called, inspired with the desire to make a Good Book: one that, through the materials, in the text, and by the visual and tactile impact, will move the viewer from the everyday to a new place, a place that stirs the soul. I see the library as the book's "museum" and take great pleasure in finding our books held in library collections. It is my belief that to be really successful, an artists' book must be just as satisfying to view in a glass case as it is to hold and read. The book's exterior (binding) needs to be like a sculpture (by this I mean a stand alone aesthetic experience) so that even if a viewer can only see the binding they will still find aesthetic satisfaction. And the book's interior also has to be like a painting (by this I also mean a stand alone aesthetic experience) so that when a viewer looks at it (even if only behind glass) they will find aesthetic satisfaction. Finally, to be really successful, a book must have meaningful content, so that when a viewer has the opportunity to explore the text and illustration, they will find another layer of aesthetic satisfaction. In the finest of artists' book, a thing I like to call the "Mona Lisa of the Aritsts' Book" these three elements (structure, visual content and literary content) will all work together seamlessly so that the viewer will find asthetic satisfaction on every level. We live in exciting times. Since the invention of the printing press the book, as a medium for the artist, has been encumbered by function. Over the course of the last two decades the personal computer has released the book from servitude to information, and thus set it free to become an aesthetic object, a work of art. Now, free of function, the book has become a recognized medium for artists to work in. The book artist marries content, form and the passage of time into a single unified artwork called an artists' book. The book is the most complex and versital art medium that exists, and so I believe by the end of this century paintings and sculpture will be moved to the storage rooms of musems and in their place visitors will find artists' books on display. For those of you who are new to our work; Donna does the illustrative art work for our books.